In this heartfelt and moving tribute to Laura Nyro, one of the greatest and most covered songwriters of the 20th century, pianist, singer Christine Spero and her group take the listener on an unforgettable journey through some of Laura’s most memorable songs. 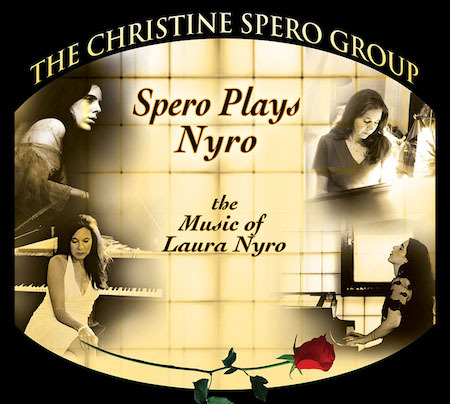 Spero Plays Nyro reminds us that Laura’s music is poignant and timeless. The arrangements are hip, the vocals are beautiful, the musicianship is stellar. The exquisite arrangements are true to Laura’s originals but with many sweet creative touches, beautifully interpreted in the group’s own distinct style. 2018 is an important year for fans of the music of Laura Nyro, one of the 20th century's greatest songwriters. March 3, 2018 marks the Fiftieth Anniversary of the release of Laura Nyro's album Eli and the Thirteenth Confession. It was considered one of the two most important albums that year, the other being the Beatles White Album. The Christine Spero Group will be bringing Spero Plays Nyro, ("And When I Die", "Eli's Coming", "Stoned Soul Picnic", "Wedding Bell Blues", "Sweet Blindness") A surprise Blood Sweat and Tears tune or two with Steve to My Fathers Place. Christine has fully recaptured Laura’s spirit and passion with beautiful renditions running the breadth and depth of Laura's emotions. Drummer Peter O'Brien and bassist Scott Petito create a rhythm section that keeps the music driving and steady but never imposing. Saxophonist / percussionist, Elliot Spero, adds excellent sax solos,flutes and multiple percussion accents. In February 2015 the group released their latest Cd, Spero Plays Nyro. Available at Cd Baby, iTunes, Amazon and streaming on Pandora, Spotify & Youtube. Christine Spero, Winner and Finalist of the USA Songwriting Competition Jazz/category, had her start in the music business as a teen with legendary producer Don Kirschner and Neil Sedaka. She earned numerous accolades for her melodic, emotionally powerful and soulful writing and performing and her two original Cds, "We Call it Music" and "My Spanish Dream" have received strong press from USA Today, Long Island Newsday, Billboard, Jazz Times, JAZZIZ, All About Jazz, Time Out New York, The Village Voice, Chronogram, Albany Times Union, Kingston Freeman.